Once you sign your contract to serve your country in the military, you are obligated to fulfill that contract as the military is obligated to provide a job, health and dental care, an opportunity for promotion, and leave (vacation). However, a service member's obligation to his armed service continues until terminated. Generally, this time period is determined by the terms of the enlistment contract, but earlier termination may result due to administrative or disciplinary separation based upon specifically identified conduct on the part of the service-member. There is no gray area to what is right or wrong in the military. The military, as well as the civilian laws, apply and can be referenced in the Uniform Code of Military Justice (UCMJ). There are two types of early separations given by the armed forces of the United States to enlisted service-members: punitive discharges and administrative separations. Punitive Discharges: Punitive discharges are authorized punishments of courts-martial and can only be awarded as an approved court-martial sentence pursuant to a conviction for a violation of the UCMJ. There are two types of punitive discharges: Dishonorable Discharge (DD) -- which can only be adjudged by a general court-martial and is a separation under dishonorable conditions; and Bad-Conduct Discharge (BCD) -- which can be adjudged by either a general court-martial or a special court-martial and is a separation under conditions other than honorable. Administrative Separations: Administrative separations cannot be awarded by a court-martial and are not punitive in nature. Enlisted personnel may be administratively separated with a characterization of service (characterized separation) or description of separation as warranted by the facts of the particular case. Characterization at separation is based upon the quality of the member's service, including the reason for separation and guidance below. The military determines the "quality of service" in accordance with standards of acceptable personal conduct and performance of duty for military personnel found in the Uniform Code of Military Justice (UCMJ) directive and regulations issued by the Department of Defense and the Military Departments, and the time-honored customs and traditions of military service. The quality of service of a member on active duty or active duty for training is affected adversely by conduct that is of a nature to bring discredit on the Military Services or is prejudicial to good order and discipline, regardless of whether the conduct is subject to UCMJ jurisdiction. Characterization may be based on conduct in the civilian community, and the burden is on the respondent to demonstrate that such conduct did not adversely affect the respondent's service. The Military considers the reasons for separation, including the specific circumstances that form the basis for the separation, on the issue of characterization. As a general matter, regulations require the military to determine characterization upon a pattern of behavior rather than an isolated incident. There are circumstances, however, in which the conduct or performance of duty reflected by a single incident provides the basis for characterization. Honorable. The Honorable characterization is appropriate when the quality of the member's service generally has met the standards of acceptable conduct and performance of duty for military personnel or is otherwise so meritorious that any other characterization would be clearly inappropriate. General (Under Honorable Conditions). If a member's service has been honest and faithful, it is appropriate to characterize that service under honorable conditions. Characterization of service as General (under honorable conditions) is warranted when significant negative aspects of the member's conduct or performance of duty outweigh positive aspects of the member's military conduct or performance of duty outweigh positive aspects of the record. Many people believe that separating at the end of the normal term of service guarantees an Honorable Discharge. This is not so. All administrative discharges take into account the individual's conduct and performance. Too many disciplinary infractions or low-performance report ratings may result in a General (under honorable conditions) discharge. Other Than Honorable Conditions. OTH Discharges the lowest form of discharge one can receive administratively. These are warranted when the reason for separation is based upon a pattern of behavior that constitutes a significant departure from the conduct expected of members of the Military Services, or when the reason for separation is based upon one or more acts or omissions that constitute a significant departure from the conduct expected of members of the Military Services. Examples of factors that may be considered include the use of force or violence to produce serious bodily injury or death, abuse of a special position of trust, disregard by a superior of customary superior-subordinate relationships, acts or omissions that endanger the security of the United States or the health and welfare of other members of the Military Services, and deliberate acts or omissions that seriously endanger the health and safety of other persons. Dishonorable Discharges. There is a difference between the OTH Discharge and the Dishonorable Discharge. The OTH does not require a court-martial in order to leave the military; this happens purely through administrative process. However, a dishonorable discharge is the lowest form of discharge you can receive and must come from a general court-martial - in other words - a trial. These are typically criminal acts that lead to dishonorable discharges. You will not only leave the military with no benefits of having served, but you will take with you a criminal record that will be visible by future employers. Administrative Separations break down into two basic areas: voluntary separations and involuntary separations. A discharge at the end of one's term of service is an example of a voluntary separation. However, the involuntary discharge process is fairly straightforward. The commander makes an election to pursue involuntary discharge proceedings and notifies the respondent in writing. Once the commander receives the letter with attachments from the respondent, he/she determines whether or not to proceed with the discharge proceedings. If the commander elects to proceed an administrative discharge board is convened (if required). If the board is not required, the commander forwards the package to the approval authority (usually the installation commander) for final approval or disapproval. The seriousness of the circumstances forming the basis for initiation of separation proceedings, and the effect of the members continued retention on military discipline, good order, and morale. The likelihood of continuation or recurrence of the circumstances forming the basis for initiation of separation proceedings. The likelihood that the member will be a disruptive or undesirable influence in present or future duty assignments. The ability of the member to perform duties effectively in the present and in the future, including potential for advancement or leadership. The member's entire military record - everything. Isolated incidents and events that are remote in time normally have little value in determining whether administrative separation should be effected. The use of such records ordinarily are limited to those cases involving patterns of conduct manifested over an extended period of time. The Separation Authority appoints to the Administrative Board at least three experienced commissioned, warrant, or non-commissioned officers. Enlisted personnel appointed to the Board must be in grade E-7 or above and must be senior to the respondent. At least one member of the Board must be serving in the grade of O-4 or higher, and a majority of the board must be commissioned or warrant officers. The senior member is the president of the board. The Separation Authority also may appoint to the Board a nonvoting recorder. A nonvoting legal adviser may be appointed to assist the Board. The respondent may testify in his or her own behalf, subject to the provisions of Article 31(a), UCMJ (Self Incrimination). At any time during the proceedings, the respondent or counsel may submit written or recorded matter for consideration by the Board. The respondent or counsel may call witnesses in his or her behalf. The respondent or counsel may question any witness who appears before the Board. The respondent or counsel may present argument prior to when the Board closes the case for deliberation on findings and recommendations. Whether each allegation in the notice of proposed separation is supported by a preponderance of the evidence. Whether the findings warrant separation with respect to the reason for separation set forth in the Notice, if more than one reason was contained in the Notice, there must be a separate determination for each reason. The Board makes a recommendation of or separation (Not guilty or innocence). If the Board recommends separation, it may recommend that the separation be suspended. If separation or suspended separation is recommended, the Board recommends a characterization of service or description of separation. Parenthood: A member may be separated by reason of parenthood if as a result thereof it is determined that the member is unable satisfactorily to perform his or her duties or is unavailable for worldwide assignment or deployment. Separation processing may not be initiated until the member has been counseled formally concerning deficiencies and has been afforded an opportunity to overcome those deficiencies as reflected in appropriate counseling or personnel records. Physical or Mental Condition: Individuals may be involuntarily separated on the basis of designated physical or mental conditions, not amounting to Disability, that potentially interfere with assignment to or performance of duty. Such conditions may include but are not limited to chronic seasickness or airsickness, enuresis, and personality disorder. 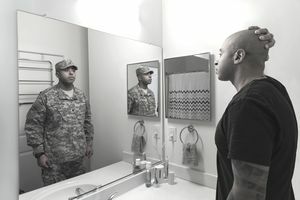 Separation on the basis of personality disorder is authorized only if a diagnosis by a psychiatrist or psychologist, completed in accordance with procedures established by the Military Department concerned, concludes that the disorder is so severe that the member's ability to function effectively in the military environment is significantly impaired. Separation for personality disorder is not appropriate when separation is warranted for other reasons. For example, if separation is warranted on the basis of unsatisfactory performance or misconduct, the member usually will not be separated under this section regardless of the existence of a personality disorder. Disability: A member may be separated for disability under the provisions of 10 U.S.C., Chapter 6l (reference (n)). Disability separations usually result in an Honorable, or Entry Level Separation. Erroneous Enlistment: A member may be separated on the basis of an erroneous enlistment, induction, or extension of enlistment. An enlistment, induction, or extension of enlistment is erroneous in the following circumstances, if: (1) It would not have occurred had the relevant facts been known by the government or had appropriate directives been followed; (2) It was not the result of fraudulent conduct on the part of the member; and (3) The defect is unchanged in material respects. Erroneous Enlistment. normally receive an Honorable Discharge, unless eligible for an Entry Level Separation (Less than 180 days of military service). Fraudulent Entry Into the Military Service: A member may be separated on the basis of procurement of a fraudulent enlistment, induction, or period of military service through any deliberate material misrepresentation, omission, or concealment that, if known at the time of enlistment, induction, or entry onto a period of military service might have resulted in rejection. Characterization of service or description of separation is based upon the service record and severity of the fraudulent entry. If the fraud involves concealment of a prior separation in which service was not characterized as Honorable, characterization normally shall be Under Other Than Honorable Conditions. Unsatisfactory Performance: A member may be separated when it is determined that the member is unqualified for further military service by reason of unsatisfactory performance. Separation processing may not be initiated until the member has been counseled formally concerning deficiencies and has been afforded an opportunity to overcome those deficiencies as reflected in appropriate counseling or personnel records. Counseling and rehabilitation requirements are of particular importance with respect to this reason for separation. Because military service is a calling different from any civilian occupation, a member should not be separated when unsatisfactory performance is the sole reason unless there have been efforts at rehabilitation under standards prescribed by the Secretary concerned. The service shall be characterized as Honorable or General (under honorable conditions). Alcohol Abuse Rehabilitation Failure: A member who has been referred to a program of rehabilitation for drug and alcohol abuse may be separated for failure through inability or refusal to participate in, cooperate in, or successfully complete such a program in the following circumstances: (1) There is a lack of potential for continued military service; or (2) Long-term rehabilitation is determined necessary and the member is transferred to a civilian medical facility for rehabilitation. Minor Disciplinary Infractions: A pattern of misconduct consisting solely of minor disciplinary infractions. If separation of a member in entry-level status is warranted solely by reason of minor disciplinary infractions, the action should be processed under Entry-Level Performance and Conduct. A Pattern of Misconduct: A pattern of misconduct consisting of (a) discreditable involvement with civil or military authorities or (b) conduct prejudicial to good order and discipline. Commission of a Serious Offense: Commission of a serious military or civilian offense if in the following circumstances: (1) The specific circumstances of the offense warrant separation; and (2) A punitive discharge would be authorized for the same or a closely related offense under the Manual for Courts-martial. Civilian Conviction: Conviction by civilian authorities or action taken that is tantamount to a finding of guilty, including similar adjudications in juvenile proceedings, when the specific circumstances of the offense warrant separation and the following conditions are present: (1) A punitive discharge would be authorized for the same or a closely related offense under the Manual for Courts-martial or (2) The sentence by civilian authorities includes confinement for 6 months or more without regard to suspension or probation. Separation processing may be initiated whether or not a member has filed an appeal of a civilian conviction or has stated an intention to do so. Execution of an approved separation is usually withheld pending outcome of the appeal or until the time for appeal has passed, but the member may be separated before final action on the appeal upon request of the member or upon direction of the Secretary concerned. Characterization of service for misconduct will normally be Under Other Than Honorable Conditions, but characterization as General (under honorable conditions) may be warranted for those with outstanding military records. Security: When retention is clearly inconsistent with the interest of national security, a member may be separated by reason of security and under conditions and procedures established by the Secretary of Defense in DoD 5200.2-R. Characterization is based on the service record and performance of the respondent. Unsatisfactory Participation in the Ready Reserve: A member may be separated for unsatisfactory participation in the Ready Reserve under criteria established by the Secretary concerned under DoD Directive 1215.13. Characterization of service or description of a separation is based on the service record and the requirements of DoD Directive 1215.13 (reference (p)). Weight Control Failure: A member may be separated for failure to meet the weight control standards when it is determined that the member is unqualified for further military service, and the member is not medically diagnosed with a medical condition that precludes or interferes with weight control. Separation processing may not be initiated until the member has been counseled formally concerning deficiencies and has been afforded an opportunity to overcome those deficiencies as reflected in appropriate counseling or personnel records. Characterization of the discharge will normally be Honorable unless characterization of service as General (under honorable conditions) is warranted by the military records. These are the most common reasons for involuntary separations from military service. The Department of Defense also authorizes each of the military services to establish additional reasons for administrative discharges, based on the unique qualifications of the particular service.